286 x 203 mm. – 118 leaves: ff. , Cxvi. Numerous ornamental woodcut initials, a large illustrated woodcut border and 81 woodcuts. The great Florentine poet Giovanni Boccaccio wrote his biographical work De claris mulieribus (‘On Famous Women’) around 1360-1362 as a counterpart to his earlier collection De casibus virorum illustrium (‘On the Fates of Famous Men’). The work combines the stories of both the revered and the reviled women of renown, offering exempla of behaviours that should inspire the reader to aspire to a virtuous life. The present printed Boccaccio is an important witness to Renaissance Humanism north of the Alps as the first Latin edition of this text. 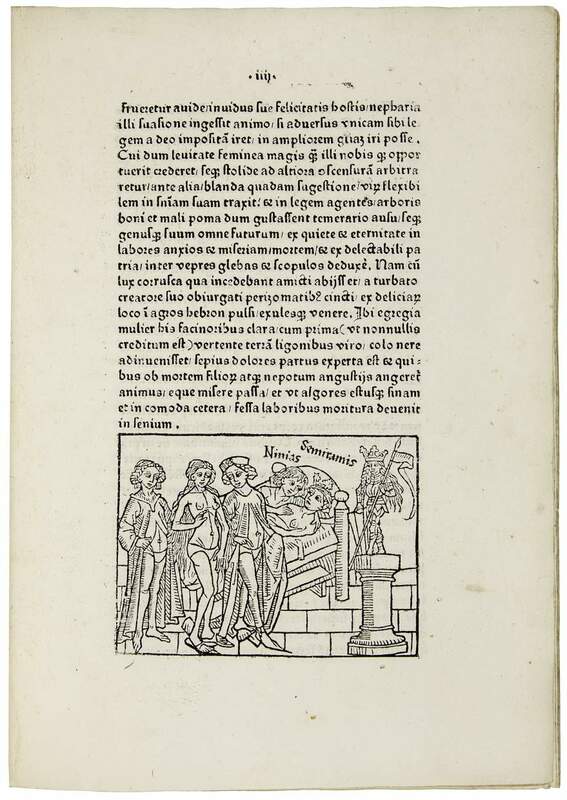 The ‘Master of the Ulm Boccaccio’, one of the most important German illustrators of the incunabula period, was named after his work in the present book, also noteworthy as the first fully-illustrated book printed in Ulm.